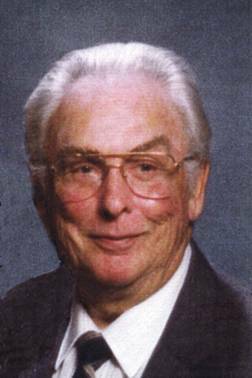 Robert B. Alford, 80, passed peacefully from this life to the next after a long, courageous battle with heart disease Thursday, Feb. 6, 2003. Robert was born March 16, 1922, in Mineral Wells. He was a Willow Park resident for the last 16 years and a former resident of Arlington for 40 years. He was a member of First Baptist Church of Willow Park. Robert was a contract compliance officer for the federal government, from which he retired after 36 years. 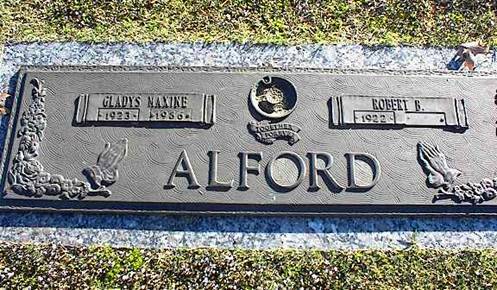 He was preceded in death by his parents, two brothers, one sister and his first wife, Gladys Maxine McFadin Alford. Survivors: Wife, Maxine Harris Alford of Willow Park; son, Robert W. Alford of Arlington; granddaughters, Carleen and Janelle; stepchildren, Charles Wayne Alford and Cymbe Walston; 13 step grandchildren; seven great-grandchildren; and sister, Minnie Lee Harris of California. This photo was taken before Robert died in 2003. AAFA NOTES: SSDI records confirm the birth and death dates of Robert Alford (SS #456-28-0730 issued in TX). His last residence is listed as Weatherford, Parker Co., TX. Bob and his second wife Maxine were faithful members of AAFA and attended every meeting from 1989 through 1996. They stopped coming to the meetings only when it was demanded by their health. Bob was proud of the many accomplishments of his father, especially his musical ability. See some of his music in AAFA ACTION, March 1990..
Bob and Maxine were proud of their unusual marriage circumstances and took some pleasure in talking about it. It was the second marriage for both of them. Maxine was previously married to Charles Alford, Bob’s brother. Bob and Maxine, as “in-laws” were good friends. When each of their spouses died, one thing led to another, and they eventually married. Their sons by their first marriages were first cousins and then became step-brothers. Bob and Maxine made sure both sons were members of AAFA, and they too were at the 1989 meeting in Houston. His lineage: Robert Burns 1922 TX1, James Burns 1890 TN2, Charles A. 1868 TN3, James Madden 1832 TN4, Isaac W. 1805 NC5, Bailey 1781 NC6, Isaac 1748 NC7, Julius 1717 VA8, Lodwick 1710 VA9, James 1687 VA10.